Consolidated events schedule maintained on this website, containing a terse version of events at both Cowpens and Kings Mountain plus related events elsewhere. National Park Service websites specifically related to Cowpens:. Cowpens National Battlefield NPS website. Original Cowpens website developed by local park staff, accessible from above (inDEPTH). Contains a number of accurate and balanced articles on the commanders and the battle. Devil of a Whipping by Larry Babits. Available from bookstore at Cowpens National Battlefield. It is easier if you buy it there in person, but you may check on its availability (item number and price) by calling the park (864-461-2828) and you may order it with a credit card by calling 877-628-7275. The Patriots at the Cowpens by Dr. Bobby Gilmer Moss. Listing of individual participants based on historical records. Obtain directly from the author. This is the book that Babits credits with being the work without which "Devil of a Whipping" could not have been written. Since it is based heavily on Rev. War pension statements, it contains many passing references to others not involved in Cowpens Battle. Downright Fighting by Thomas J. Fleming. Official Park Handbook 135. Available from bookstore at Cowpens National Battlefield. 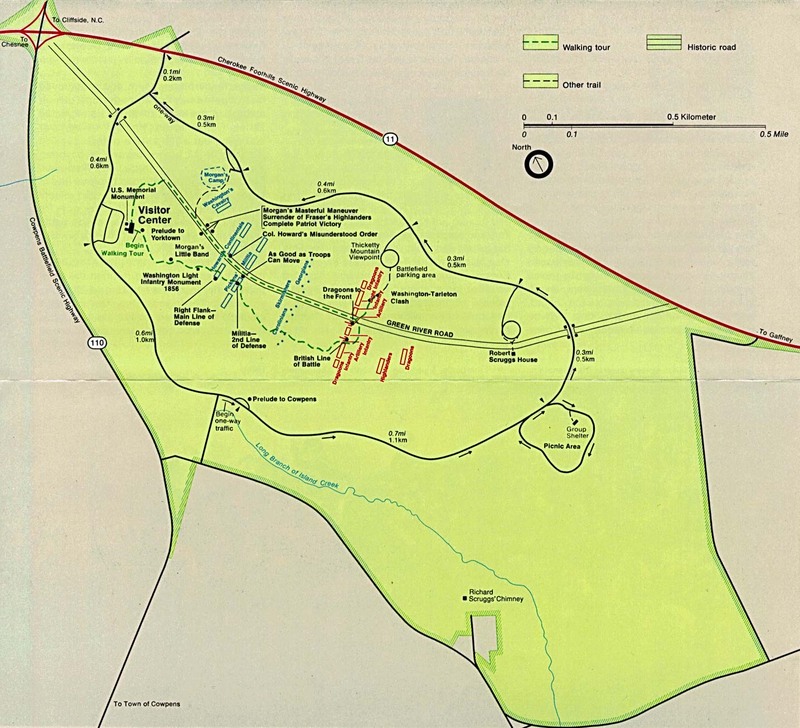 Battle of Cowpens, A Documented Narrative and Troop Movement Maps by Edwin C. Bearss. Available from bookstore at Cowpens National Battlefield. Prior to "Devil of a Whipping" was probably the best source of maps of the battle. Full text version available online. The Battle of Cowpens	by Kenneth Roberts. Available from bookstore at Cowpens National Battlefield. Like "Devil of a Whipping", gives a well-rounded treatment of Tarleton. Autobiography of a Revolutionary Soldier by James P. Collins. This book is usually available at bookstore at Cowpens National Battlefield Less than 4 pages are devoted to the Cowpens Battle per se, but this is an esteemed and oft-quoted first person account of the Rev. War in the area. The Green Dragoon by Robert D. Bass. A biography of Banastre Tarleton. It is available at bookstore at Cowpens National Battlefield. Campaigns of 1780-1781 in Southern America by Banastre Tarleton. Babits' work will focus new attention of this book since his observation is that Tarleton accurately reported the facts if he knew them. Tarleton gave the briefest possible account of his encounter with the militia line, essentially dismissing them as a minor hinderance. This is remarkable considering the large number of casualties he suffered in those few minutes. This is usually available at bookstore at Cowpens National Battlefield. The Road to Guilford Courthouse by John Buchanon. This highly readable account of the Rev. War in the Carolinas gave full treatment to Cowpens Battle. It is notable for the background information it provides on all the major participants, and of the events leading up to the battle. Available from bookstore at Cowpens National Battlefield. Maryland Historical Chronology showing Marylanders fighting at Cowpens. Battles that the First Maryland took part in. First Continental unit to use bayonet against the British. The Delaware Continentals, 1776-1783. Brief listing of battles in which the Delaware Regiment served. Search for cowpens. Chapter 2: The War Of American Independence from the National Guard Detailed History. This is one of the few accounts that tells of "Tarleton's Quarter" at KM, but none by Tarleton himself. Daniel Morgan, by Janie B. Cheaney. Details on picture at link following. Maxwell's Brigade -- An Elite Corps from the Philadelphia Campaign. Daniel Morgan and His Riflemen. Brief sketch and references. The Surrender of Gen. Burgoyne at Saratoga, painting by John Trumbull, begun in 1786,, showing Morgan in foreground in buckskin. From III. The Mccords And The Scotch-Irish. Describes Morgan as uncle of Daniel Boone. August 1775 from Connecticut Society of the Sons of the American Revolution. Ode to Valour, by Mary Darby Robinson, actress, playwright. With b/w picture of Tarleton. Portrait of Tarleton by renowned artist Joshua Reynolds. From CFGA website. Tarleton the deadbeat. Bills in Long Island still unpaid. Carter's Grove, the Williamsburg legend about Tarleton's riding a horse up stairs, from Williamsburg Myths and Legends. American Revolution War In South, Part II. Search for tarleton. An account of "Buford's Massacre". Scotia Press. The books of Dr. Bobby G. Moss dealing with records of individual participants. Park features map, 1997 (PDF). The Cowpens from Many Were Sore Chased And Some Cut Down - Fighting Cornwallis with the Rockbridge Militia by Odell McGuire. A re-enactment photo by the Spartanburg Herald-Journal. The Battle of Cowpens, oil painting by Don Troiani, from the Allen's Creations website. The Battle of Cowpens from Battles of the American Revolutionary War by the American History Archives. Shows troop movement map. View of Cowpens Battlefield [55k] from a great page of pictures of Carolinas battle sites from the The Real Unofficial Battleground Page. Cowpens NB from the National Parks Foundation. National park economic data for 1994 from the Thoreau Institute. Includes Cowpens, Kings Mountain and the OV NHT. A look at parks from an entirely different viewpoint. Cowpens Battle from Battles of the American Revolution. Use right-click and 'View' on pictures for larger view. South Carolina's Revolutionary Heritage. General, but relevant comments on impact of RW on the region, and impact of the region on the RW. Staff ride glossary. Not exhaustive, but has many useful definitions. The Cowpens Flag. First used 1777. Used by the 3rd Maryland Regiment. Flag alledged to have been carried at Cowpens hangs in Maryland State House. The Cowpens Flag from the Flags Over America page of Riverside Chapter Of CASSAR. The American Revolution from the British point of view, including description of Cowpens. Search for cowpens. American Revolution War In South, Part V. Includes Battle at Cowpens. Lt. Drury Harrington. Search for drury. Pvt. James "Horse Shoe" Robertson from Thomas M. Owen's Revolutionary Soldiers in Alabama. Search for robertson. Also, RW pension statement. Delaware Regiment of Foot, re-enactors page, brief history and pictures of uniform. Captain Robert Kirkwood of Delaware from SAR chapter named in his honor. Listed as U.S. Senator. Third name on list. Listed as 5th governor of Maryland. JEH papers listed as being at Maryland Historical Society. Search for John Eager. Buried at Old Stone Churchyard from The Political Graveyard. Brief bio from The Political Graveyard. Captain Robert Anderson. Search for anderson. Samuel Rankin, Member of the Cumberland County, Pennsylvania, Militia. Died 1834. Not included in Moss.